I love to read, but the season of life I find myself in at the moment doesn't allow for me to sit and read to myself much during the day while the kids are awake. Other than when I'm nursing Emmalie, I read a couple nights a week in bed on my e-reader. Other nights I fall asleep so quickly, I hardly remember my head hitting the pillow, while I pray Emmalie has another good night of sleep ahead of her. In the last several months, I've come across two books that I'd love to recommend. I'm a non-fiction girl, and rarely read a novel. I like the practical side of a non-fiction book, and tend to zip through them faster. But I do love reading great novels to the kids, and I guess I like novels more than I let on. Maybe it's just that I spend so much time reading aloud to them during the school year, that my own personal reading time begs for something different. My sister, Jen, recommened Almost Amish by Nancy Sleeth to me a few months ago, and I just finished reading it a couple days ago. The Amish are always intriguing to me, I love learning about them and their ways. 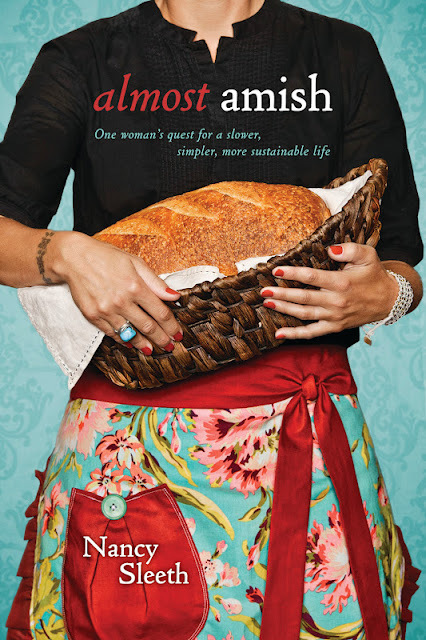 This book takes a variety of topics including hospitality, posessions, finances, media, etc... and compares the way our modern culture views these issues and the way the Amish do things. At so many turns, our culture has things so backwards. We have a lot to learn from the Amish! There are a few things we've already put into practice - reading this book has made us rethink a few things that were already weighing heavy on my heart. We now take a break from all things with a screen on Sundays. We're just two Sundays into it, and boy, is it a breath of fresh air around here! Not that we are logging crazy amounts of screen time anyways, but it takes away the pull of the computer for us all, and turns our minds to more worthwhile pursuits. No computer time for the kids, no computer, email or facebook for Jeremy or I, and no family movie, etc... The last two Sundays, I have completed several small projects that have been on my mental to-do list forever! But it's sad how often the pull to jump on the computer "real fast" comes into my thinking. I find myself on it less and less nowadays, and that's a very good thing! We play board games, spend time outside, visit with family and friends, work on indoor/outdoor projects, and just spend time together. Which we've always done, but it's so freeing to be free from technology. And it's so funny to me that it feels so wonderful for a whole day to not do something that I have the choice to abstain from each and every day! She can be taught, folks!! The other thing that we've decided, that was confirmed by reading this book, was that we'd have a designated night of the month to open up our home to a family, couple, or person that we don't know very well. We love having people in our home, and like to do it often, but usually it's with the people we feel completely comfortable around, and who are already our good friends. I guess it's sort of selfish hospitality in a way. Extremely enjoyable? Yes. But too far inside our comfort zone to stretch us at all, and we're feeling convicted to be stretched some more! I'd highly recommend Almost Amish to you - let me know if you end up reading it, I'd love to know what you think! 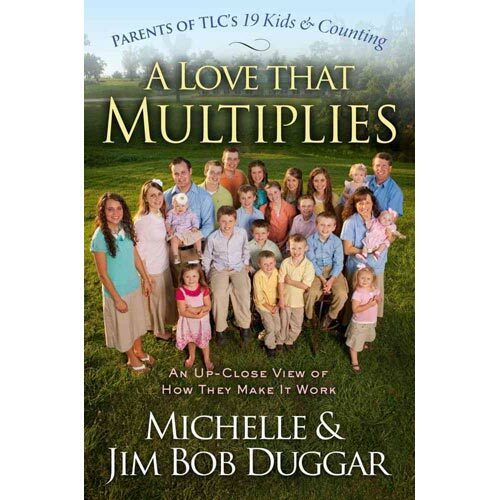 A Love That Multiplies is the second book written by the Duggars, who have nineteen children! I own and have read their first book, which is the "why" of what they do as a family. And this second book is the "how" they do things as a family, and it starts out detaling the extremely premature birth of little Josie. So much of this book applies whether you are the parents of two or twenty kids, and I really enjoyed this one even more than the first. I bought it before I read it, so I was glad it was worth the money spent! What a wise family with outstanding parents! Jim Bob and Michelle aren't just scrambling aimlessly through their roles as parents, they are following God's word, teaching it to their children, and doing a fantastic job of managing a LARGE family. "Admittedly, we often felt overwhelmed, but we had given this area of our life over to God, and in faith we kept going. We are so thankful we didn't stop, because then we had Josiah and Joy-Anna. Then after the birth of our tenth and eleventh children, twins Jedidiah and Jeremiah, some of the very people who had been so critical started complimenting and encouraging us as though we were having our first child. We didn't know if they gave up and decided they just weren't going to change our minds, or if they finally understood that we consider each child a blessing from God and saw that our older children were turning out okay! "The fact is, sometimes God asks us to do something we don't want to do. We try to teach our children this concept about life's choices from the time they are young. When we ask them to do something, they always have a choice. They can choose to obey and do what is right. Or they can choose not to obey and face the consequences. A Love That Multiplies is a book I revisit often for encouragement in my life as a mom, I'm thankful the Duggars are willing to share their lives with all of us. 4 comments on "favorite reads so far this year"
The Amish are anything but perfect, but they have done one thing right, that the modern church has shunned. The Bible is Agrarian. You cannot get around that fact no matter how much you try. And they live it out. Of course, there are areas that are getting away from it, but most of them are striving to at least continue to remain yolked with Believers in the work setting, and keeping the family unit involved with the business they run. I look around at the church in general, and you cannot tell Believers from non believers anymore, except for a very few. Lives are totally immersed in all that the world offers. Looks like some great reading material there. One of these days I'll have to get my hands on both those wonderful books. Thanks for the suggestions. Hi! I recently found your blog and checked out Almost Amish. I LOVE LOVE LOVED IT! I also got the Duggar book as well and am looking forward to starting it. I've browsed your blog briefly and am amazed at your goodness and tender heart. What a special woman you must be. Your children are blessed to have you.